LED lights have no filament or mechanical parts bound to breaking or blown bulb failure. There's not a point where they stop working, but its degradation occurs throughout their lifepsan. 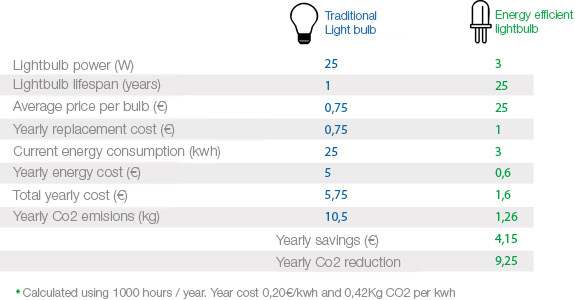 LED can enjoy a 52,000 hours lifespan. Aproximately at the 6 years mark (24h/day, 365days/year) they start losing intensity below 70%. A LED lamp is powered by a low current, using really low power, and therefore generating very low heat, saving in air conditioned areas. They also adapt to most power sources and reduce shock risk. LED light is more bright and sharp than halogen and fluorescent. Besides, they turn on inmediatlyLa luz Led, es mucho más brillante y nítida (fractions of a second) and has no defects, flickering or intensity variations. Thanks to its size, LED can be embedded into objects. With LED we can make objects emit their own lights or project images. LED devices do not contain mercury, they save a great amount of power, do not produce Infrarred radiation or light pollution. Besides, 99% of their components are recyclable, and they're the ideal partner of solar energy. LED lamps can be modified in every way imaginable, be it color (without a filter) intensity or color temperature, to create the perfect ambience with the push of a remote button. Visual impact for indoor and outdoor use, home or commerce. LED lighting solutions always adapt to your personal needs. It doesn't matter the size of your project, we can help you during planning, development and use, and share with you our knowledge in innovative Light technology.